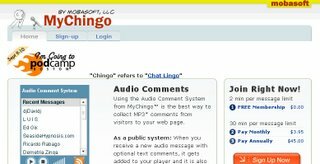 Mychingo is an online audio comment system. You can put it into your webiste or blog, your readers are easy to record or play their audio comments. Free user can use 2 min per message, and paid user can use til 30 min per message.